Packers assistant Ben McAdoo was a hot commodity in recent weeks and, in the end, the Giants won his services. GREEN BAY, Wis. — With all of the interviews that Ben McAdoo had set up across the league, the Green Bay Packers knew it was a matter of when — not if — they lost their quarterbacks coach. That time came Tuesday night when McAdoo was hired to be the new offensive coordinator for the New York Giants. The Giants made the announcement official on their Twitter page, confirming an earlier report by FOX Sports’ Alex Marvez. "He’s prepared himself for opportunities potentially that are out there," Packers coach Mike McCarthy said last week of McAdoo. "I think the world of Ben. I’ve been with Ben a long time and seen him diligently prepare himself to move forward. So whatever opportunities that do come by, he’ll do a phenomenal job." McAdoo had also spoken with the Cleveland Browns for their vacant head-coaching position and recently met with the Miami Dolphins for the open offensive coordinator job. Ultimately, McAdoo chose the Giants after the Giants chose McAdoo. "I think this is the best coach for the job," Giants head coach Tom Coughlin said of McAdoo on the team’s website. "With his experiences, I think he brings a lot to the table. Our players are going to be excited to hear what he has to say." 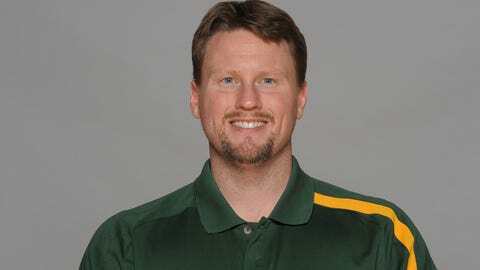 McAdoo had been with the Packers since McCarthy became head coach in 2006. McAdoo spent his first six years as Green Bay’s tight ends coach before being promoted to quarterbacks coach in 2012. "This will be the first job where I call plays on Sunday," McAdoo said on the team’s website. "When you get your first opportunity in this league, you start to prepare for that (calling plays). I feel like with the way we prepared with the coaches, and Mike McCarthy does a great job getting the coaches ready, we’ll respond. I’m ready to take that task head on." McAdoo takes over the offensive coordinator job in New York from Kevin Gilbride, who retired last week. "This is obviously a big step," McAdoo said. "It’s also another step in the progression of a coach’s career. It’s a golden opportunity for me. It’s an opportunity I feel I’ve been groomed for. And I look forward to it." The Packers will now have to replace McAdoo and find a new quarterbacks coach. The most likely in-house promotion would be running backs coach Alex Van Pelt, who spent his NFL playing career as a quarterback and later coached quarterbacks for two years with the Tampa Bay Buccaneers.